There’s that old 1960s query: what if they had a war and no one came? 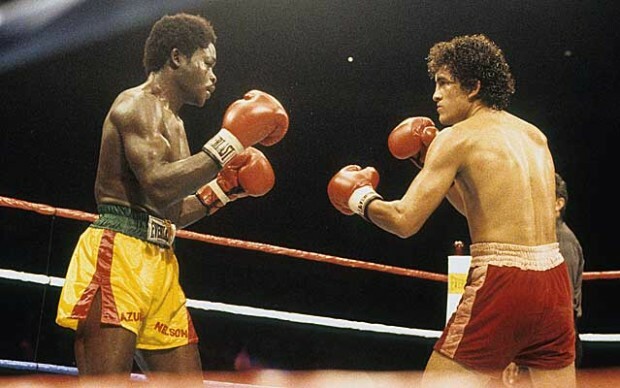 Considering the 1982 clash between featherweights Salvador Sanchez and Azumah Nelson, the better question is: what if they had an action-packed, dramatic war between two Hall of Fame champions and no one knew about it? 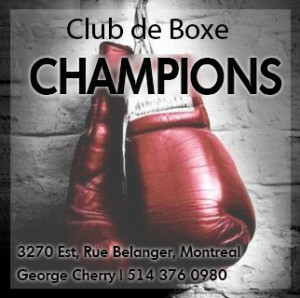 In boxing, it’s easy to get vexed about all the terrific matches that never were or will be, but long-time fight fans know it’s always better to be grateful for what you get, than to fret over what the cruel boxing gods deny you. 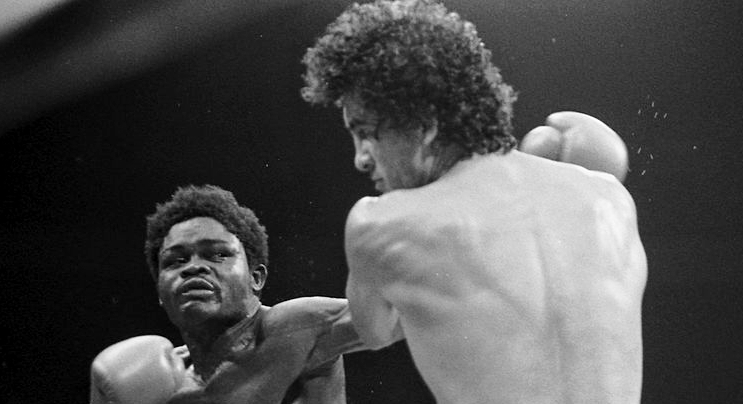 And thus, 36 years later, we can look back with renewed appreciation at the dream fight that was between two great warriors, Nelson and Sanchez. 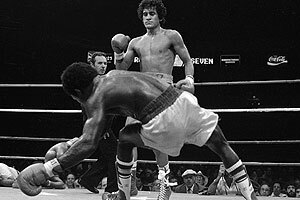 Boxing fans and pundits must be forgiven for not recognizing back in 1982 what a truly top-shelf match was in store. Fact was, no one outside of Ghana knew anything about Nelson, who had a paltry record of 13 bouts and was brought in as a last second replacement for top contender Mario Miranda. Aside from holding the Commonwealth featherweight title, he possessed no qualifications for a shot at the world championship whatsoever, much less a bout with the man regarded as one of the finest performers in the sport. As a result, only 5500 showed up at Madison Square Garden in New York that night. But those who did were treated to a truly thrilling battle. In contrast to Nelson, Sanchez, at only 23 years of age, entered the ring that night with the mantle of greatness already upon his shoulders. Since turning pro in 1975, his career had moved fast, almost as fast as the sports cars he loved to drive. 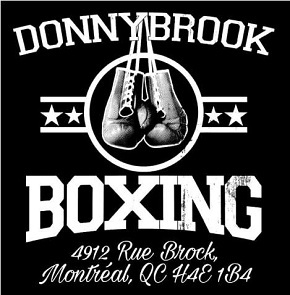 He fought frequently, at least six bouts per year, and since battering Danny Lopez to win the featherweight crown, he had notched nine title defenses in just two years, his exciting knockout win over Wilfredo Gomez cementing his status as, pound-for-pound, one of the very best. 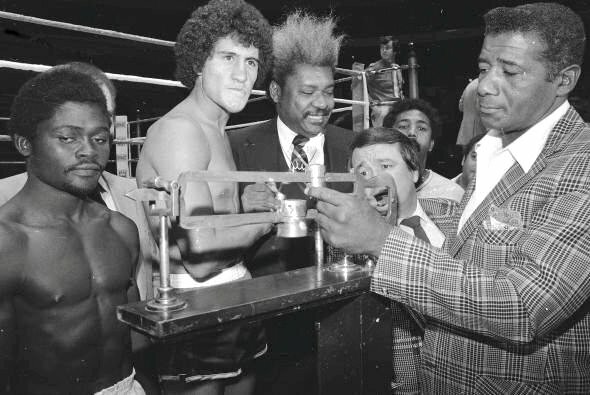 Promoter Don King had recently begun negotiations for a big money super-fight between Sanchez and lightweight king Alexis Arguello, and at this point there really was no telling how far young Salvador’s talents could take him. Having been featured on network television in almost all of his title wins, the American public had come to admire his precision counter-punching, granite chin and excellent stamina. To everyone’s surprise, he would need all of these attributes to overcome the courageous challenge of Azumah Nelson in one of the most exciting contests in division history. From the opening bell, Nelson, with everything to gain and nothing to lose, and with a noisy contingent of fellow Ghanaians in the stands chanting and cheering, took the fight to Sanchez with a vengeance. The champion was a notoriously slow starter but even so, the ferocity of Nelson’s early forays surprised everyone. Setting a relentless pace, he scored with solid left hooks in the opening seconds and then followed up that attack with hard right hands behind an aggressive jab. A right lead shook Sanchez near the end of round one and Nelson leaped in to connect with both fists, even treating the fans to an improvised “Ali shuffle” between flurries of punches. Nelson would go on to capture three world titles. Nelson continued to make the fight in the fifth, rocking Salvador with a thudding hook midway through, the last minute of the round a toe-to-toe slugfest. The sixth was close, with Sanchez coming on at its end, but early in the seventh the champion, searching for a way to decisively turn the tide, finally found the opening he was looking for. Anticipating Azumah’s right, he beat him to the mark with a perfect left hook that almost put the challenger down. 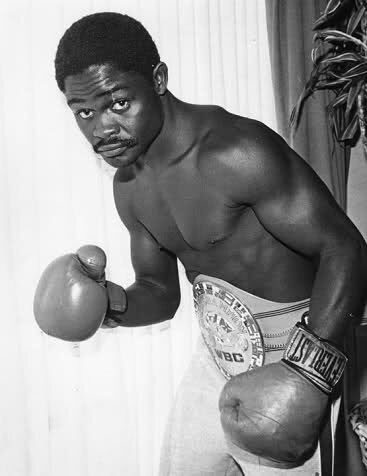 A hurt Nelson stumbled and then went toe-to-toe, winging wild shots, but like the surgeon he reportedly wanted to be after his boxing career ended, Sanchez calmly fielded the maelstrom of blows to get in another short, precise hook that put Azumah on the canvas. Nelson down in round 7. 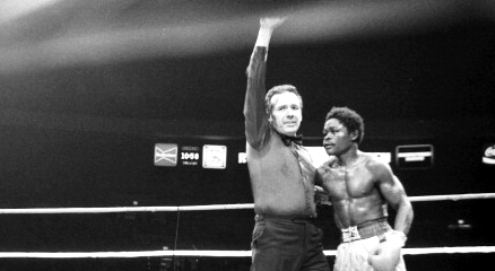 Nelson rose at the count of six and, demonstrating the heart and resilience that would enable him to win three world titles, went back on the attack. Ever poised and patient, Sanchez took his time, allowing the fearless challenger to get his punches off before stunning him again near round’s end with a sharp right. The start of the eighth saw Sanchez in control, seemingly growing stronger with each exchange, and hurting Nelson again with a counter left. In the ninth, he tried to box Nelson, exploiting his better mobility and longer reach, but the challenger pressured him, forcing him into a series of brutal, inside exchanges in which Sanchez dug away at Azumah’s ribs and belly. But the punishment appeared to have no effect on Nelson who came back to take the next two rounds on sheer aggression. The final minute of the eleventh saw the two warriors go toe-to-toe and the inexperienced African, to everyone’s surprise, got the better of it, landing thudding rights to the head before briefly staggering Sanchez with a left hook to the jaw. At this point everyone expected Nelson, who had never fought past the tenth, to fade, but the twelfth saw no let up in the intensity of the two-way action. And as the challenger took the thirteenth on the strength of his brawling attack, his right hands forcing Sanchez to retreat, it began to dawn on incredulous reporters and ringsiders that they were witnessing not only a war for the ages but possibly too a momentous upset. But it was not to be. The fourteenth was another great action round but finally – finally! 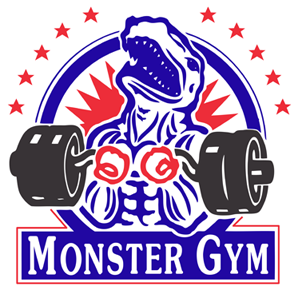 – there appeared some give on the part of the challenger, his strength waning, his legs faltering, his punches wider and slower. He had shocked everyone with his gallant stand, had given Sanchez the toughest battle of his career, and in the end it was not so much skill or technique or even experience deciding things as much as grit, stamina and the champion’s impervious chin, which had previously withstood bombs from Lopez, Gomez and Juan La Porte and now had taken the best from Nelson. As the final round began, the brave challenger once more pressed, forcing Sanchez to the ropes and letting his hands go, but at the same time leaving himself open for Salvador’s deadly counters. A right backed Nelson up and a hook staggered him and it was now obvious his legs were gone. Their positions reversed and it was Azumah on the ropes as Sanchez dug both hands to the body before backing off, making Nelson come forward, giving him the chance to throw punches, the better to create openings that the Mexican sharp-shooter could mercilessly take advantage of. Seconds later a series of flush shots had the challenger in deep trouble and still, he would not stop slinging leather, until yet another crushing left hook buckled his legs and left him out on his feet, his hands down, his whole body contorted and off balance. Two more lefts finally put Nelson on the canvas but, incredibly, Azumah scrambled to his feet almost immediately and waved at Sanchez to come back, to keep fighting, as if the knockdown had never happened. But despite his astonishing bravado, Nelson was finished. 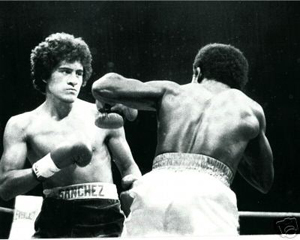 All heart and courage, he held his hands up for referee Tony Perez, begging him to let the battle continue, but when it did it was the champion landing at will and the challenger staggering all over the ring, before Perez finally stepped in and ended it, waving his arms and awarding the victory, and the tenth successful defense of his crown, to Salvador Sanchez. Referee Perez stops the battle in the final round. There are a number of reasons why this classic fight has been largely overlooked in the years since. First of all, Sanchez vs Nelson had the misfortune of taking place during a banner year for monumentally exciting clashes. 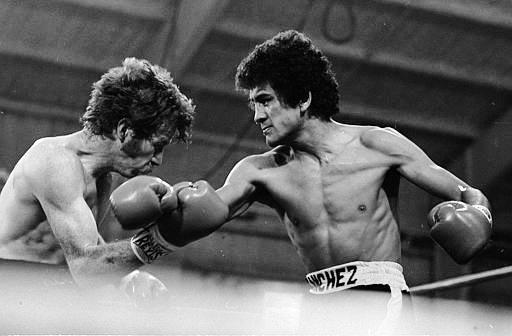 A thrilling contest which would have easily been Fight of the Year at other points in time found itself in fourth place behind Aaron Pryor vs. Alexis Arguello, Bobby Chacon vs. Rafael Limon IV and Wilfredo Gomez vs. Lupe Pintor, all magnificent wars. Secondly, unlike those excellent matches, there had been no expectation of a great fight. No one knew who Nelson was, most had anticipated a routine win for Sanchez, and thus relatively few fans saw the thrilling battle. But in addition to these facts, the event which overshadows this great fight is what took place just three weeks later. A lover of sports cars, a man and a fighter who moved fast, with intensity and purpose, Sanchez had been driving his Porsche at high speed on a highway in central Mexico when he attempted to pass a truck. He somehow miscalculated, slamming into a second truck, and Salvador “Chava” Sanchez, the 23-year-old champion with seemingly limitless potential, the conqueror of Lopez and Gomez and Nelson, was killed instantly. An entire nation, and scores of boxing fans, mourned the death of this great warrior, a boxer who had, in less than three years, left an indelible mark on the sport and established himself as a true great. And part of what makes him great, an essential element in his legacy, is this epic fight, a contest made more meaningful and resonant as Azumah Nelson’s career unfolded and we learned that his brave effort on that summer night was not the result of some miraculous circumstance, but instead testament to the great Ghanaian’s talent and tenacity, to the abilities of a man who would later be recognized as the greatest African boxer of all-time. Wow. Awesome read as always. In my opinion, had it not been for the untimely death of Sanchez, it would be him, and not Julio Caesar Chavez Sr., who would be viewed by most as the greatest boxer to ever come out of Mexico. To accomplish all that he did by the age of 23 is almost unthinkable in today’s generation of boxers. I was there that night. Great fighters. Amazing ending. I’ll never forget it. I have Nelson’s gloves from that night.